FluidFlow will enable you to simulate the flow of compressible and incompressible fluids; non-Newtonian/ non-settling liquids and settling slurries; and 2-phase gas/liquid fluids in complex pipe networks with heat change calculation for any pipe or component. FluidFlow's flowsheet presentation of the pipe system in either isometric or orthogonal format makes it easy for you to navigate around large models. The display of input and calculated data concurrently with the flowsheet provides you with an almost intuitive understanding of how the system is performing. FluidFlow comes with a user-definable database of more than 1200 fluids with their full thermo-physical properties plus databases of pumps, fans, valves and all types of line equipment. Download a fully functional copy of FluidFlow, valid for 14 days with unlimited support. Thank you for you interest in Fluid Flow. Please click here to download your copy of the software. This download includes a copy of the software, installation and user guides. 1. Click the download link above. 4. When you first run the software you will be presented with a dialogue box asking "Do you wish to Activate FluidFlow3 now?" select NO and FluidFlow will now run in fully-functional mode for 14 days with all modules activated. After 14 days the software will revert to ‘demo’ mode. To continue running in fully-functional mode you will have to register FluidFlow with us. Instructions are included in the zipped document file. Simulates the flow of liquids and gases (water, hydrocarbons, air, steam, natural and other gases, petroleum fractions etc.) in pipe systems. Determines the performance of multiple pumps, fans, control valves, orifice plates, non-return valves and any type of line equipment in complex pipe networks. Calculates the friction loss with non-Newtonian liquids, particulate (settling) slurries, power law fluids, Bingham plastics, paper pulp and 2- phase liquid/gas flows. Calculates heat transfer in pipe systems . Dynamic Analysis - perform time-based or what-if analysis. Understanding how a plant will react to changing operation conditions can be vital. Dynamic analysis removes guesswork when performing such simulations. Flows, pressures and friction losses around complex pipe networks. Velocity, density, temperature change, choked and sonic conditions in compressible flow. Thermo-physical properties of fluid mixtures. Determines non-Newtonian / non-settling physical property coefficients from rheological data and associated apparent viscosity. Determines solids effect for particulate (settling) slurry flow. Determines pipe economic size or velocity. Pump power, efficiency and NPSH. Total Heat Balance - heat loss/gain through pipe walls (insulated, uninsulated, buried); heat or temperature change acrossheat exchangers and other line equipment. Systems containing multiple pumps and fans in parallel, series or booster configuration. Systems containing multiple control valves. Natural and other gas reticulation including coal seam methane and LNG systems. Mining, pharmaceutical, food, wastewater and mineral process systems. Fixed fire protection design - hydrant ring-mains and deluge systems. Spray/sprinkler systems of any type. Ventilation and fume extraction (rectangular ducts can be simulated). High pressure gas flow (sonic conditions detected). Infrastructure services (water, sewage, gas). 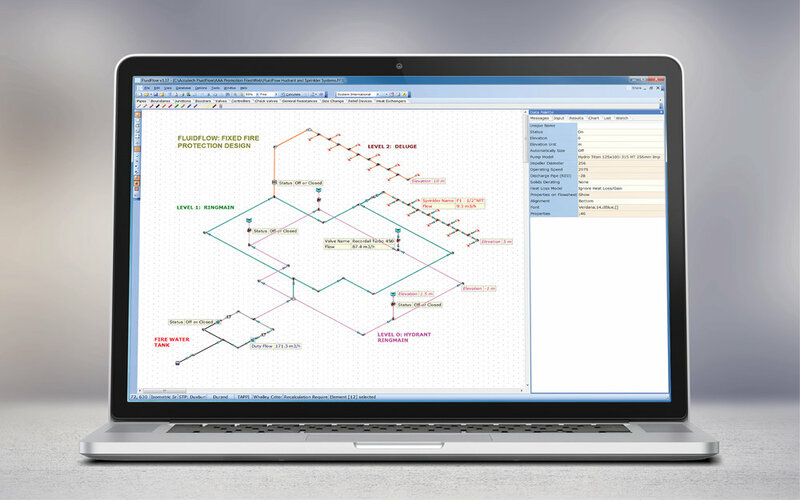 Design and layout of the piping network in FluidFlow is in a familiar flowsheet format using click-and-drag to select piping components from the equipment toolbar in order to add elements (pipes, pumps, valves, fittings etc) to the model. Pipes are rubber-banded between elements. Panning, zooming and cut-and-paste operations are all available to allow you to design your network with minimum effort and maximum flexibility. Piping schematics can be displayed in orthogonal or isometric format. 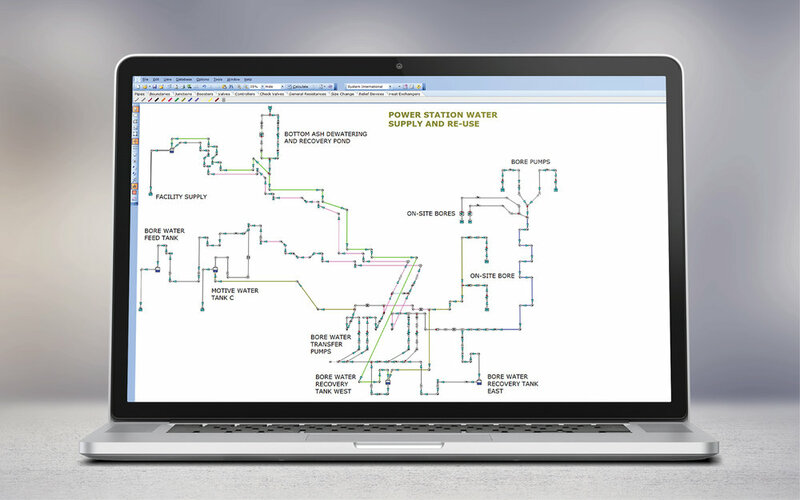 FluidFlow’s flowsheet presentation of the pipe system makes it easy for you to navigate around large models. The display of input and calculated data concurrently with the flowsheet provides you with an almost intuitive understanding of how the system is performing. Display any input or output data next to a pipe or equipment item (upper image - yellow box) or hover the cursor over any pipe or element to display any user-defined input values or calculated results (upper image—blue box). 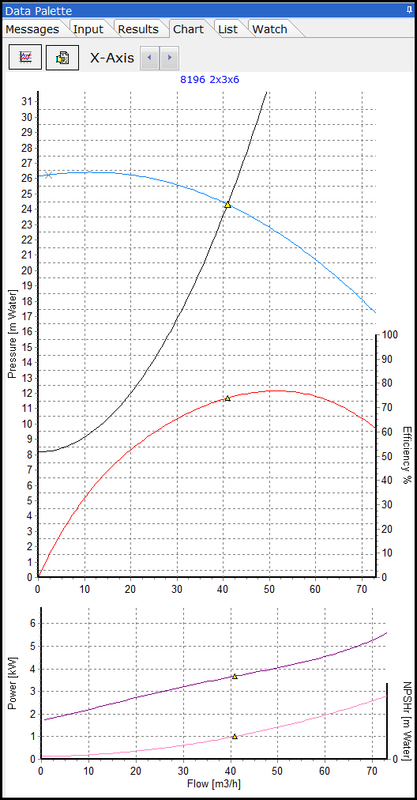 Charts show the performance of equipment items such as pump characteristic and system curves (image right). In-built report writer - fully user-definable. Output in PDF, HTML or Word format. Output a fully annotated copy of the flowsheet as an Excel picture as an excellent way of communicating with colleagues or clients. Gas calculations make no simplifying assumptions of ideality, adiabatic or isothermal processes etc. Pressure losses are determined by solving the momentum and physical property equations simultaneously. This means more accurate results, particularly at higher Mach numbers. Choked conditions and sonic flows are properly accounted for. Power-Law fluid correlation - Pseudoplastic, Dilatant (solution according to Darby). Bingham Plastic correlation (solution according to Darby). Yield Pseudoplastic (solution according to Herschel-Bulkley). Correlation from ‘The Application of Liu Dezhong Formula in Slurry Piping Systems’. Friedel L. Improved friction pressure drop correlations for horizontal and vertical two phase pipe flow. Ispra European Two Phase Flow Group meet, Paper F2 (1979). A Simple Mechanistic Model for Void Fraction and Pressure Gradient Prediction in Vertical and Inclined Gas/Liquid Flow Khasanov et al. Scripting offers the ability to develop real-time analysis of plant and systems from within the FluidFlow interface. The powerful dynamic simulation capabilities ensure you develop a thorough understanding of how your system operates in real-world scenarios. Engineers are able to set scenarios via Pascal or Basic in a similar way to how a macro works in Excel. Scripting removes the guesswork from your what-if analysis. Study how any flow system behaves at start up/shut down as operating conditions change. Evaluate variable speed pump control. Establish control valve performance for different system control philosophies. Review plant pressure conditions as demand profiles vary. Accutech provides both engineering and key-stroke support for FluidFlow backed up the developer, Flite Software. The annually renewable Maintenance, Update and Support (MUS) agreement ensures that your licence is always up-to-date and that we can provide timely assistance. Send us your design file and we can explain your results, check for errors and feedback suggestions for improving your design. We use our video-chat capability to navigate you through your model, whilst we both concurrently view the flowsheet.